Finally: Book a cleaner apartment stress-free and online. Your MaidEasy-booking process happens completely online. You simply enter your apartment details and pick your desired services and then pick a date. On the date you picked we will be arriving, on time and with all of the cleaning products needed, so you can sit back and relax. 3. Voilà! As good as new. Your apartment will be clean and tidy again in no time. It couldn't be any easier. Trust is everything. And we want to earn it. Letting a stranger into your apartment requires a lot of trust. We understand that. That is why during the first appointment you will have the chance to tell our maid(s) all about your wishes and areas we should focus on. Because only if we know and understand your wishes, will we be able to do our work to a satisfactory level. You just want your apartment to be clean, plain and simple? No problem. Our maid(s) work using an exact procedure so that nothing is forgotten or missed. Lernen Sie uns kennen und machen Sie sich in Zukunft &uuml;ber wichtigere Dinge Gedanken, als &uuml;ber Ihre liegengebliebenen Hausarbeiten. Whether regularly or just the once. We come over when we are needed. Things can be even simpler if you trust us with your key. If you want you can give us your key, so we can let ourselves in on the specified date. You also have the possibility, using the customer menu, to set times when we can be in your apartment, for example when you are at work. This way you can live your life and we'll take care of your household. 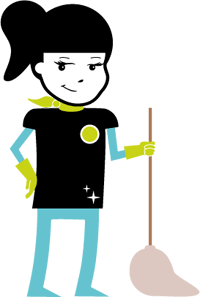 We put a lot of value on precision and little goes unnoticed by the keen eyes of our maids. At the same time the principle of: The tidier the apartment the better the results will be.